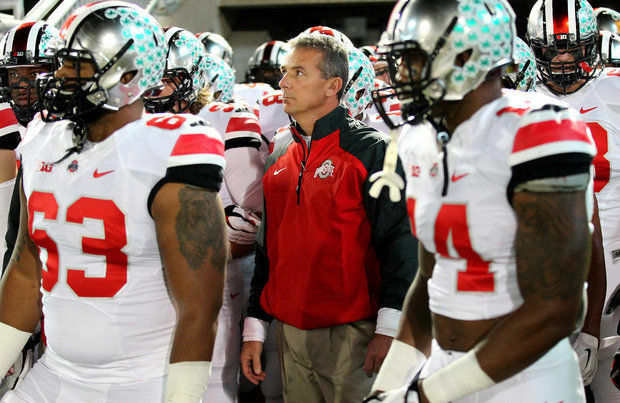 Urban Meyer and the Ohio State Buckeyes escaped Happy Valley with a 31-24 win over Penn State. I thought I would change up my approach this week and write about a Big Ten matchup. Most people had written off the Ohio State Buckeyes when quarterback Braxton Miller went down for the season, but after an embarrassing home loss to Virginia Tech, they have been one of the hottest teams in the country. Redshirt freshman quarterback J. T. Barrett has taken over and the Buckeyes have been a high octane offense, averaging 56 points per game in their last four contests. The Penn State Nittany Lions under new coach James Franklin won their first four games, but had lost two in a row coming into their home game against the Buckeyes. Ohio State was playing in only their second road game and Happy Valley was their toughest environment so far this season. The home crowd affected the Buckeyes offense and kept the game close for the Nittany Lions. After holding Penn State on their first possession, Barrett got the offense going and they quickly scored on a 10 yard run by sophomore running back Ezekiel Elliott to take a 7-0 lead. After that initial drive, the Penn State defense, which is the highest ranked defense in the Big Ten did their part to keep the game within reach. They held the Buckeyes to 10 more points before the half with the Buckeyes leading 17-0 at the half. The Penn State defense stepped up quickly in the 2nd half. On the Buckeyes first possession of the 3rd quarter, senior defensive tackle Anthony Zettel dropped into coverage in a zone blitz and picked off Barrett, returning the ball 40 yards for Penn State’s first score of the game. The pick six brought the Nittany Lions with 10 points. Neither offense was able to generate a score for the rest of the quarter and the Buckeyes went into the final quarter with a 17-7 lead. Early in the 4th quarter, Penn State senior linebacker Mike Hull picked off a Barrett pass and returned it to his own 45, giving the Nittany Lions good field position. Quarterback Christian Hackenberg was then able to put together a scoring drive and connected with freshman receiver Saeed Blacknall to cut the score to 17-14 with 11:09 left in regulation. Both defenses held firm and Penn State got their last chance with 2:58 left to play, but they were 91 yards away from a touchdown. Hackenberg did a masterful job of moving his team downfield, moving his team 77 yards on a whopping 19 plays. The drive stalled at the Ohio State 14 and Sam Ficken kicked a 31 yard field goal to send the game into overtime. The Nittany Lions got the ball to start overtime and they scored on a 1 yard run by senior running back Bill Belton to take their first lead of the game, 24-17. Ohio State answered with a 3 play drive, scoring on a 5 yard run by Barrett, however, on the extra point, Hull was called for a personal foul. So, not only did the Buckeyes tie the game at 24, but they would get the ball back at the 12 yard line. Barrett scored his second touchdown of the overtime to give his team a 31-24 lead. The Buckeye defense, then stood tall, holding Penn State scoreless on their possession to escape with a win. The win by Ohio State keeps them in the hunt for a playoff spot, but it may be tough to get there. Yesterday, the playoff committee released their first set of rankings and even though Ohio State is 6-1, they are only ranked 16th. The loss to Virginia Tech, who isn’t a very good team probably hurt them considerably. They will have a lot of ground to make up to get into the final four. To have a chance, they will need to win out, including a game at #8 Michigan State and then win the Big Ten Championship Game. Theoretically, they can get there, but they will need to keep winning and get a lot of help. Devin Smith, WR, Sr (6-1, 197): Good size and athleticism. #2 on the team in yardage and tied for first on the team with 5 TD’s. Very good special teamer. Downed a punt on the 1 yard line. Only had 1 catch for 8 yards. Jeff Heuerman, TE, Sr (6-5, 255): Big target. Able to split out or play as an in-line tight end. Good field awareness. Tough red zone matchup due to his size. Good blocker that does a good job setting the edge on outside runs. Led the team with 3 catches for 19 yards and 1 TD. Taylor Decker, LT, Jr (6-7, 315): Prototypical size for an NFL left tackle. Only returning starter from 2013. Has the movement skills to get to the second level and block linebackers. Does a good job protecting the quarterback’s blind side. Threw a key block on Barrett’s TD run in the first overtime. Michael Bennett, DT, Sr (6-2, 288): A bit small for an NFL 3 technique. Quick off the ball. Disruptive and causes problems in the backfield. Quickly sheds blockers. Had a quiet game with only 2 tackles. Adolphus Washington, DT, Sr (6-4, 295): Good athleticism. Has the strength to shove blockers into the backfield. Good inside pass rusher. Has the ability to take over games. Had 4 tackles, 1 ½ tackles for loss and 1 sack. Joshua Perry, OLB, Jr (6-4, 252): Good size. Active linebacker that is always around the ball. Good blitzer. Led the team with 18 tackles and 2 tackles for loss. Curtis Grant, ILB, Sr (6-3, 238): Does a good job filling holes on the inside runs. Had 4 tackles and had a roughing the passer call that set up the game tying field goal late in the 4th quarter. Armani Reeves, CB, Jr (5-10, 198): Does a good job in off coverage. Breaks hard on the ball once it’s thrown. Brings the wood. Able to play in nickel situations in the slot. Had 4 tackles and two pass breakups. Akeel Lynch, RB, Jr (6-1, 215): Good size. Gave the team a spark in the running game which was struggling before he came into the game. Has enough speed to bounce it outside. Led the team with 38 yards rushing on 13 carries and had 1 catch for 3 yards. Bill Belton, RB, Sr (5-10, 204): Does a good job on draw plays. Quick feet. Runs with good pad level. Able to play wildcat QB. Good receiver out of the backfield. Struggles in pass protection. Only had 8 yards rushing on 9 carries, but scored a touchdown in overtime to extend the game to a second overtime. Had 2 receptions for 5 yards. Zach Zwinak, FB/RB, Sr (6-1, 233): Tough, physical runner that could be moved to fullback at the next level. Does a good job playing on special teams and covering kickoffs. Was carted off the field and will be lost for the season due to a leg injury. Jessie James, TE, Jr (6-7, 255): Huge target with long arms and a huge catch radius. Makes difficult catches. Good blocker. Had 4 catches for 22 yards and had 1 drop. Angelo Mangiro, OL, Jr (6-3, 309): Started the game at center, but then was forced to move to right tackle due to injuries. Good run blocker. Did a decent job after having to move to tackle, but did whiff once against Joey Bosa, giving up a sack. C.J. Olaniyan, DE, Sr (6-3, 252): Big and strong. Plays the run well. Always seems to be around the ball. Had 9 tackles. Anthony Zettel, DT, Jr (6-4, 274): Has played both inside and outside. May be a better fit as a defensive end at the pro level. Has good athleticism and speed. Has the ability to drop into coverage. Does a good job pushing the pocket and gets his hands up when rushing the passer. Had 2 tackles, 1 tackle for loss, 1 sack, 1 batted pass and had a 40 yard pick six (his 2nd straight game with an interception). The pick six changed the momentum of the game and put his team back in the game. Deion Barnes, DE, Jr (6-4, 255): Quick first step. Disruptive. A smart player that follows his reads and stays in position. Good flexibility to dip his shoulder and get inside his blocker. Able to play as a defensive end or stand up and play linebacker. Had 7 tackles, 1 ½ tackles for loss and 1 sack. Mike Hull, ILB, Sr (6-0, 232): Tackling machine that always seems to be around the ball. Second in the Big Ten in tackles. Takes great pursuit angles and flies to the ball. Drops well into coverage and would probably be a good fit for a team running the Tampa 2 defense. Led his team with 19 tackles, 2 ½ tackles for loss and 1 interception. Was called for a personal foul on the extra point the end of the first overtime. The penalty gave the Buckeyes the ball at the 12 yard line and set up an easy touchdown to win the game. Jordan Lucas, CB, Jr (6-0, 198): Good size. Does a good job in off coverage. Closes quickly on the ball. Uses big hits to cause incomplete passes. Had 2 tackles and 1 pass breakup. This entry was posted on October 29, 2014 by draftmaniacs in Scouting reports and tagged 2015 NFL draft, Adolphus Washington, Akeel Lynch, Angelo Mangiro, Anthony Zettel, Armani Reeves, Big Ten Championship, Bill Belton, Braxton Miller, C.J. Olaniyan, Christian Hackenberg, College playoffs, Curtis Grant, Deion Barnes, Devin Smith, Ezekiel Elliott, J. T. Barrett, James Franklin, Jeff Heuerman, Jessie James, Jordan Lucas, Joshua Perry, Michael Bennett, Mike Hull, NFL, NFL Draft, Ohio State Buckeyes, Ohio State football, Penn State Football, Penn State Nittany Lions, Saeed Blacknall, Sam Ficken, Taylor Decker, Zach Zwinak.